If the NSA only invited TechCrunch to its birthday party, it’d have to eat its cake alone. 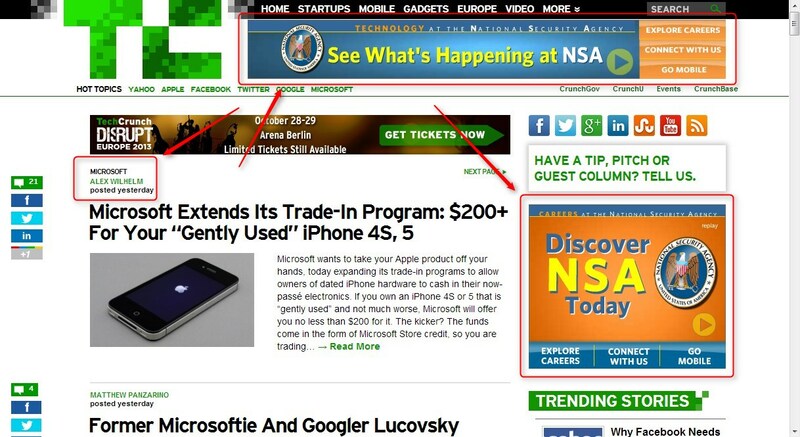 While we aren’t big fans of the NSA, it appears to fancy our readers, as it consistently advertises on our site. This makes me slightly uncomfortable, as I have spent a good portion of my time these past few months excoriating and blasting the NSA for what I view as unconstitutional abrogation of our Fourth Amendment rights. And here is the NSA, spending dollars to reach our audience, through those very posts. I suppose it is vaguely democratic to grant them part of our space to make their case, but as this is a financial relationship (they pay us, either directly or through a third-party), it’s not a question of free speech. I’ve never felt a conflict of interest with an advertisement before, due in no small part to the fact that I tune them out like the rest of you. But to have the NSA directly hawking its wares on pages that sport my name doesn’t sit right with me. My name appended to a page that sports bright (lurid?) NSA branding. Please, no. Because of concerns about infringing on the privacy of American citizens, the computer analysis of such data had previously been permitted only for foreigners. Because of my distaste for the NSA and its surveillance programs, I don’t want it making payments (again, either directly or through some third-party targeting or retargeting) to any group that I have a financial relationship with. And as TechCrunch pays the rent, some NSA dollars have likely leaked into my own bank account. That’s revolting. Also revealed recently is the fact that the Justice Department targeted Edward Snowden’s email provider the day right after he went public. That ended poorly. And the Senate just admitted what we already knew, that the NSA directly taps the core fiber cables of the Internet. NSA Career Links 2 will not use location information from your device to create driving directions. All location information is used by a 3rd-party map application not affiliated with NSA Career Links 2 or the National Security Agency. The joke is on us, however, as the NSA essentially admitted that in the past week it tracked the location of phone calls made by United States citizens. So yeah, I don’t believe you.